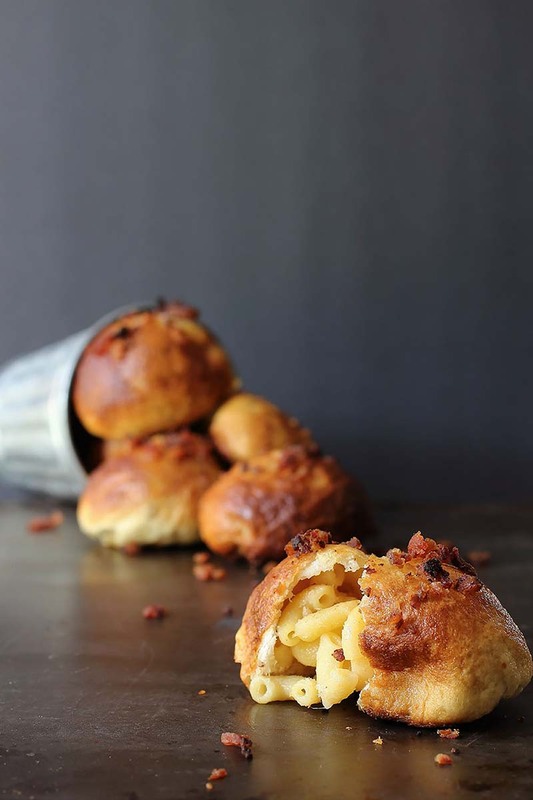 Chewy pretzel bites are stuffed with a creamy mac n' cheese and topped with crispy bacon crumbs. In a small bowl combine the warm water and yeast. Whisk gently and let sit for five minutes. In a large bowl mix together the flour, salt and grated Parmesan cheese. Add the water/yeast mixture to the flour mixture and mix with a wooden spoon or your hands until it becomes a ball. Transfer to a stand mixer with a dough hook. Mix on low speed for about 5 minutes and the dough has came together. Turn dough out onto a clean work surface dusted lightly with flour and knead the dough into an even ball shape. Grease the large bowl you just used with the olive oil. Place the dough into the greased bowl and cover with a cloth. Let it rest until it has doubled in size. Once it has doubled, turn it back out onto your work area and gently punch it down with your fingers until it's about an inch thick. Cut the dough in a grid-like pattern creating squares about 2x2-inches. Roll out each piece of dough roughly into a circle shape. Place a teaspoon of macaroni n' cheese in the center of the dough. Bring two sides of the dough into the middle to meet and pinch. Bring the other sides of the dough into the middle and pinch all the parts creating a seal on the bottom of the now stuffed pretzel bite. Roll gently in the palm of your hand to get an even circle and set on a baking tray. Bring the three quarts of water to a boil. When the water is boiling, add the baking soda and stir. Be careful because it'll foam up. Stir. Preheat the oven to 425°F. Line two baking trays with parchment paper and set aside. Add the pretzel bites to the boiling water, a few at a time, and boil for about one minute. Drain with a slotted spoon and transfer back to the tray. Once the pretzels have all been boiled, place them on parchment lined trays proper side up. Brush each pretzel bite with the egg wash and press some of the bacon crumbs on top. Place in the oven and bake for about 15 minutes and the bites have a nice dark color to them. Let them cool while you make the sauce. In a small pot, bring the beer to a boil. Add the flour and simmer for five minutes. Add the cheese, mustard and milk. Whisk until the cheese has melted and the sauce is smooth. Taste and season with salt and pepper. Add a little more milk if the sauce is too thick. You can also reheat it in the microwave if it becomes cool and thickens. Recipe created by Foodness Gracious.